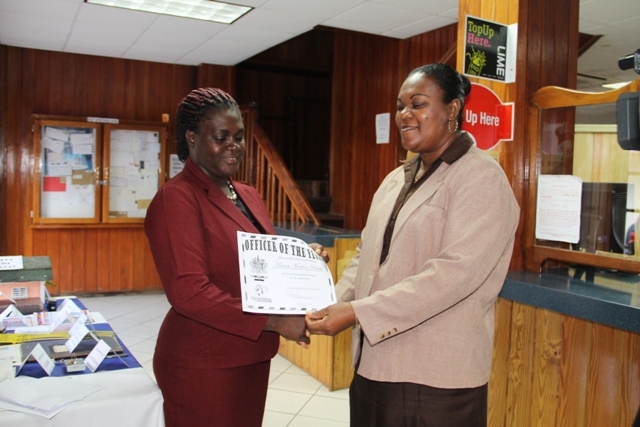 NIA CHARLESTOWN NEVIS (November 14, 2014) — Past and current workers in the Nevis Postal Services this week, were commended and recognised for their contribution to the postal services on the island. Deputy Post Mistress General Rhonda Forbes-Williams, in a brief ceremony that recognized the late Carlton Meade, Sheila Daniel, Clara Walters, Gloria Esdaille, Mavis Maynard and Bernadette Caines as past workers who made significant contributions to the postal service in Nevis. Williams also highlighted two current officers who performed creditably in their respective fields for 2014. 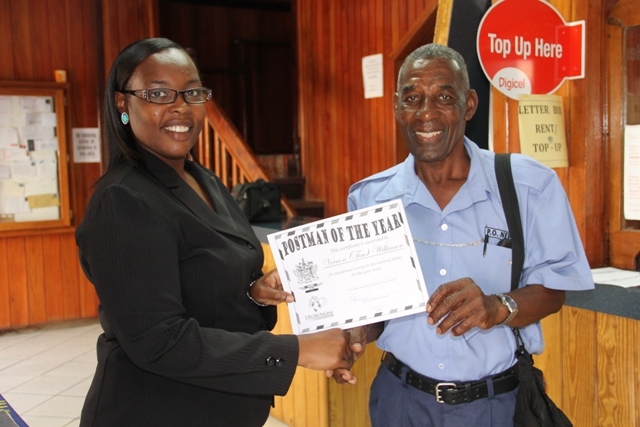 “The staff of the Post Office selected and awarded two staff members for exceptional service for the year 2014, namely Mr. Vernon Wilkinson, affectionately known as “Tim” and Marva Morton-Parris,” she said. “Four teams will be competing for the title: The post office, Nevis Water Department, Public Works Department and the Under 17 Cricket team. “It will be fun under the light from 5p.m. sharp until. It’s going to be exciting. Come out and root for your team,” she said.